There used to be that old graphic joke that was widely circulated on the net. It was about the bosses asking you to rate your own performance and seeking your own salary raise. All you had to do was click a button and fill up a form. Only problem was that when you tried to click the button it moved away and your cursor or mouse kept chasing the button all over the screen till you realised you’ve been pranked. Most of us have been pranked with it sometime or the other. This prank became popular in the political domain to ridicule election candidates. For the last 2 centuries there’s a website that lists all of Rahul Gandhi’s achievements and those of his ancestors; www.rahulgandhiachievements.com. It’s a ‘comprehensive guide’ to all of RahulG’s achievements in life as the site’s tagline says. 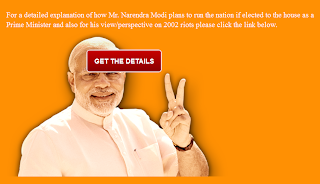 Not happy with this, the Congress eNREGA team members (a team now headed by Shashi Tharoor) came up with a counter-site called NarendraModiPlans.Com. This was about NaMo’s plans if he were to become PM. This is how it looked with the ‘Get Details’ button as the prank. 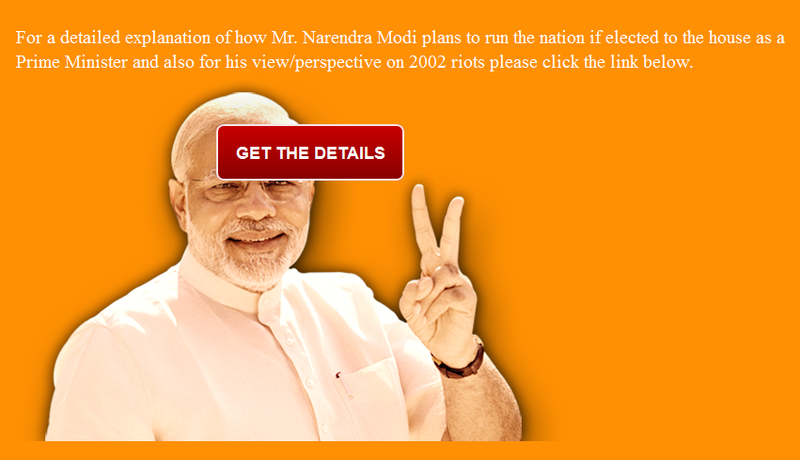 The site has since been pulled but it was just a humorous site to ridicule NaMo and there wasn’t anything wrong in it. After all, politics without ridicule and humour is no fun at all. Such gentle humour, even if offensive to some, must always be welcomed. Even politicians take pride if gentle fun is poked at them. Only the most worthless and useless politicians would have no humour directed at them. The only thing that is murky about this site is that it seems some media cronies were hand-in-glove with the ones who created the site. Our very own Scoopendra Chaubeji of CNN-IBN was among the first to tweet about the site and publicise it. He must have discovered the site through his “sources” through which he routinely scoops a lot of breaking stories. We can now reasonably suspect that CNN-IBN is part of the Congress’ eNREGA social media team. So once the NaMo fans traced the site’s builders, the ones who put up the site pulled it and now it’s gone. What a pity! The absolute category-5 moron that she is, Sagarika Ghose half the time doesn’t think before she writes or says anything. Observe carefully. 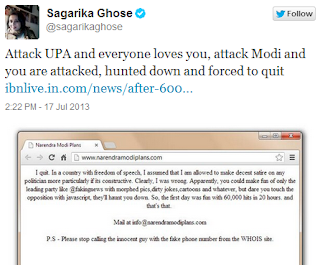 She equates attacks on UPA with attacks on Modi. This is how she keeps giving us proof over and over again that God too can be lazy and forgot to bestow her with some brains. The UPA is an entity and a political alliance which is the ruling party and Modi is an individual. 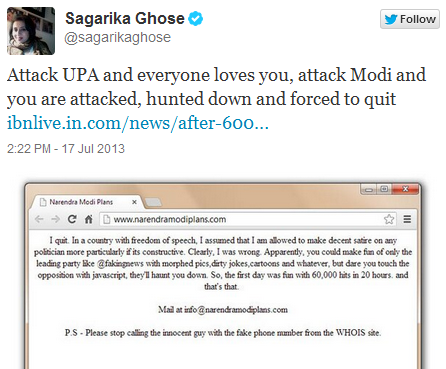 How does attacking an entity like UPA get to be equated with attacking an individual? But that is their carefully crafted crime. When it comes to UPA or Congress they will attack the party or alliance. They will not attack Sonia Gandhi who is responsible for the entire mess that the country is in. But when it comes to Modi, individual attacks on him, tarring him, mindlessly discrediting everything he says is game for them. For the whole sequence of the story just read @sureshnakhua’s storified piece. Isn’t that a typical NDTV headline? Now this fraud-loving channel also acts a mouth-feeder to the Congress party and it’s spokies. Naturally, Manish Tewari started barking early on about how Modi is lower priced than cinema tickets and how this act of his shows blah blah. Everyone quickly joined in to condemn Modi and BJP for reducing politics to mere commerce. Although, I sincerely wonder if anyone would pay to even see Manish Tewari dancing as a bar-girl. There is simply no worth in anything he utters, just as most reports of NDTV must be treated with suspicion. Nowhere in this NDTV report does it mention that the Rs.5 was a token collection for the Uttarakhand Relief Fund. It’s a first in Indian politics that people are willing to pay to listen to a politician. Usually, the Congress is known to pay people and feed them food to attend their rallies. No wonder it shocks them and the likes of Manish Tewari. However, in their enthusiasm to condemn Modi with lies both NDTV and the Congress forgot something. It was Mahatma Gandhi who started the practice of raising funds by charging a small fee for his autograph. Well, he used to charge Rs.5 too. If you do a minor math you will also realise that Rs.5 in the Mahatma’s would probably be as good as Rs.500 in the current times. 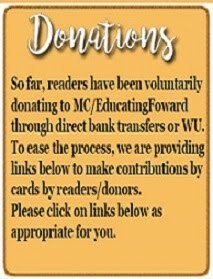 His grandson, Arun Gandhi, writes that he used to help in collecting these funds. So like the impatient fools that they are, both NDTV and Congress, particularly Manish Tewari, indirectly ended up lampooning the Mahatma too. When the facts came out all these charlatans scrambled back into the holes they crawled out from and NDTV once again deleted a report. The Macaulay sisters, NDTV and CNN-IBN, will continue to peddle their lies and their mischief till Elections 2014. They desperately want Modi and the BJP to lose because, as Modi himself puts it, their “Roji-Roti” comes from abusing him. That these colonial cousins will faithfully do for their bosses. After ending up with egg on their faces, the Congress, NDTV and CNN-IBN have now to deal with a new site called UPAPlans.Com. Enjoy! ** Lyrics from the song “I’m looking through you” by The Beatles. back in the groove. great. each day my doubts about this colonel sisters keep increasing. These two channels are new channels or propaganda machines for U Pee one All. Shame on them. even if they have little bit self respect left on them, they would decide to quit this profession or change their behavior. But I doubt. Can it be more obvious ? And , it proves something more important - the sleeveless wonder is part of the ENREGA team and had the role to promote the victimhood narrative of the site owner. All the Western added media is like this. Cancel their license to operate in India.Let Modi come we will see radical change in MSM. Great writing again, you never ceases to amuse us with your analysis and witty humor. For paid MSM it will be UPA vs Modi always. And when we blame UPA , they dont just hide under 'pseudo-secularism' burqa, but also karma of 'coalition dharma', but never utter SG/RG name. I remember when PV Narshimharao wanted to open FDI in News Media; I was not sure this is the right thing to do; to open our 4th pillar of democracy to foriegner/mnc companies; I was mildly against it..
Now I think we should think about FDI in news media, if it has to be in people favour..
What happened to Truth in Journalism. Is it now under the whims and priorities of the anchor? How do we trust whatever they earnestly portray on TV. Times Now had some credibility but with the passing of each day Arnab Goswami is becoming more predictable. Nothing of substance is discussed just blah blah. We need a good reliable unbiased news channel. I am just amazed at the desperation of the MSM and Congis combined. Its as if they want something everyday from now to 2014. All this venom, all these funds for what: to vilify one man! And then they have the nerve to talk about the bogus social welfare schemes: #FSO, MNREGA and BS like that! These are the kind of people who will sell their conscience (if they ever had one), to get what they want! I pray that god makes them pay for their sins when NaMo gets a massive mandate!Ishrat Jahan BS, Puppy BS, Burqa BS, Speech at Rs 5 BS...its just going on and on! IMO NaMo is more shrewd and reads the people much better than his predecessors. He will take the bull by its horns and make it lick our sacred soil! 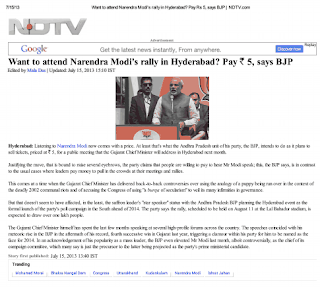 I was very disturbed when I saw the spin given to the 5INR donation at BJP-rally. I also saw the initial report at ibnlive.com regarding the fake website. The report looked like a blatant plant. MSM is now not even pretending to be impartial. I seriously wonder what is the inducement for MSM folks. Is it money? Is it threat? I like to believe that they love India too but are rabidly against BJP. That is perfectly fine. However, that cannot condone the lies they peddle on media. They have a responsibility, dammit! For spinning and twisting to peddle lies out of normal statements of NaMo, the MSM shall be sued and made accountable. Unless they pay for their lies and spinning stories it would continue even BJP comes to power in 2014. It was an art MSM had learnt during NDA regime with slush corrupt money flowing into their banks from then opposition parties. It was a conspiracy of MSM and cong to bring ABV govt in 2004 despite their excellent handling of Indian economy and containing inflation. Part of the blame goes to the middle class for having enjoyed their holiday on the election day in 2004. Excellent article. I wish NaMo could start a news channel of his own in english and at prime time all the lies should be exposed. "The Week that Wasn't with Cyrus Broacha"
From the last few weeks I have observed some aggression by BJP spokes persons against Media in their debates. Smriti caused Arnab a blush by raising a query over TOIs feeble regret over the rambo issue.In another debate on NDTV i heard the brown sahib Sashi Tharoor bring in a strange mathematics to defend Minority appeasement. He said the Hindu population of undvided India was 60% and when Pakistan was created, the hindu population in India shot up to 80%.And that was the reason they had to re assure the muslims who stayed back with sops. Can some throw light on this fact pls. Have been following your columns for some time now. * That the MSM is biased against Modi is a no brainer. But why? Why has it become so bitter? So senseless from any point of view. If its one channel fine but so many of them? It would be nice to know what's at the root of this feud. There is no feud or bitterness. The media serves those who are willing to pay. It is all about money, honey. Today, it is impossible to run a newspaper or a TV channel purely out of advertising/ subscription revenues. The overheads are far too high. The government in power is always a rich source of funds to tap, especially when it is wholly immersed in the sea of corruption. Naturally, once the media has accepted the bone, they have to bark. No choice here. In sharp contrast, in the USA, many newspapers and publications opted to close down when faced with losses. It all depends on whether you have self-respect or not. Hey Man..can't you see and observe these slave media houses..they like boot liking..of..KHNAGRESS..and get doles..
Keep watching closely all the MSMs...you will find answer.!! Congress is very good at playing both perpetrator and victim. It will end up loser. No politician in India handles our media as good as Narendra Modi, he doesn't even turn & look at them while they continue to bark & bark, Now the best part is slowly rest of the BJP has also getting aggressive with these media jokers.... this is only going to get better & better till the elections. For reasons that I cannot comprehend MSM's obsession with Modi reaching paranoidal stage. Modi visuals flashed during debates on Bihar Mid-Day meal tragedy. The first question that Arnab raised yesterday during the debate on Bihar Tragedy was..." Now where is Modi?"... strange isn't it? Wouldnt it be nice to put up a website like radical islam.com till the hunting season ends? Where you can keep a count on all the anti Modi MSM activity ? 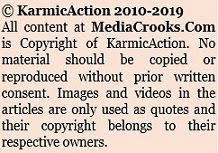 But the fuc(k) up is u cannot just post a link and sit back, coz they will disappear just Sreenivasan's memory! Manish Tiwari has long ago lost his mental balance and has become rabid. So his barks out of frustration do not merit any respect or response. Leave it alone and God willing one day he may regain sense of balance. hey admin do u know that it wasa desperate attem by paid eMNREGA workers in order to prove their victimhood,which has become the best job to do in india! !i can tell u this as they targeted faking news on their website,the site which brings best spoofs on all issues and has become a part of firstpost,the editor of faking news came out with some sharp facts on how it had been a part of the plan to close the website the other day with the obituary.you shud read the news by roshan seth ,editor of faking news...and interestingly,TOI carried the news how modi wali website was closed within a day and how some congi tweeples were outraged with it,without mentioning the fact that their is a similar website called rahulgandhiachievemnts.com!!! and how faking news are exposed this website!!!!!!! Most institutions in the country have become "committed" obviously towards the crown, had it not been for the internet and the social media, people would have never come to know of the "achievements" of UPA-I and II. Someone commented that they thought that the mainstream media, being one of the pillars of democracy, will play an objective role. This feeling is natural as one thinks this objectivity stems from the fact that journalists in MSM were "Pada Likha". In India, unfortunately, just like the twists they give to their reporting, we have a MSM that is "(Paid)a (Lick)a". There goes one pillar! Ravi,Navigating through the UPAPlans.com is really a fun! what is the meaning of Macaulay? Nobody can put the word "moron" and "bimbo to so much effect like you. I can almost see the crooks flinching each time you use these words slap them. Everytime I read your blog i get the same satisfaction as watching Rajinikanth lashing out the villains in style. God Bless you so that you can continue to give us treats. "Everytime I read your blog i get the same satisfaction as watching Rajinikanth lashing out the villains in style. God Bless you so that you can continue to give us treats." Exactly my sentiments too !! This is off the subject; but I would like to mention one fact. These corrupt media crooks thought they could make or break any one. Modi is going from strength to strength despite their malicious witch hunt. It makes them very mad. Makes us smile to see these liars mad. Completely agree with you. Unfortunately in today's vicious political atmosphere, the Dalits are unable to see past tokenism. To bring them around the idea of governance would take atleast another decade. They just don't believe in anyone other than their local Dalit parties who sadly ensure that they live in fear of oppression as a votebank. Considering how Jehadis & Church tries to woo them, I Thank God that Dr Ambedkar did not convert to Islam or Christianity, otherwise it would have been unimaginable situation to deal with for Hindu society. Excellent article as usual. as far as All these Mains Stream Media Journalist are Concern they also gone Bankrupt and Long ago forgot their Journalistic Profession. Attacking UPA is fine when it comes to Sonia + Nehru + Robert + Any Congress Minister is caught in Corruption Charges the Entire MSM comes to their Rescue. What jayanti natrajan said when Sonia Gandhi was Caught in Office Of Profit Scam "She is a Widow" Was She Ban To Contest The Election? What is Her Knowledge about the Indian Constituition? Indira gandhi Lost Case in the Court related her Election She Imposed Emergency in India the Criminalisation + Corruption of Politics in India Yes Credit Goes to her and her Family. The Famous Bofors Scandal was the Gift from her Son to we Indians. And Don't Asked the Gifts Given by Firangi Memsaheb of Congress 2G+RailGate+CoalGate+Oil For Food+Land Deals Of Her Son-In-Law+ Price Rise+Riots name any Corrupt Practice this Party is so deeply routed in that. Than overall Arrogance of this Corrupt Regime+ Corrupt MSM had the Guts to say that Attack UPA People will Love You of course Yes that is Your Job as Journalistic Ethics You Have To Attack Ruling Party / Ruling Coalition not Defend them. Because Ruling Coalition Have All the Government Machinery to their advantage. Dr. Subramaniam Swamy is rightly said that he will Expose the Corruption of the Minister in Ruling Party. Why there was No Big Debate on Our P.M. Speech that too From Lal Qila that "Miniorities Have The First Right On Indian Natural Resources". Why don't they talk about Sardar Patel Who Question the Responsibility and Integrity of Miniorities towards India. We Majority always been Question and Labeled now Hindu Terror. That shows the Bankruptcy of the Entire Congress + Main Stream Media. People Should Stop Calling and Thinking that Media is the 4th Pillar of the Democracy atleast not in India because they all are Paid News Channels and all these Channels are not National Channels. BJP state govt to focus on strict e-governance for the bureaucracy desist accountability and would do all to break or do something that is likely to damage the govt itself like it happened in the Gujarat case (Police officers falling for money power of Khangress). To insulate itself and use the data against the corrupt officials e-governance is good for it tracks inefficiency of each bureaucrat, making him vulnerable to any wrong actions that he might done. For a policy to work the administration and judiciary has to be controlled and things will delivery automatically. It's always a pleasure to read the real media ie you. I've really been unable to understand why our media is so obsessed with Narendra Modi? why can't they report with similar enthusiasm on quotes & misquotes, adventures & misadventures of the Gandhi Family or our Silent PM? I pray to God that Sonia, Rahul & MMS along with their media crooks are publically humiliated very soon.